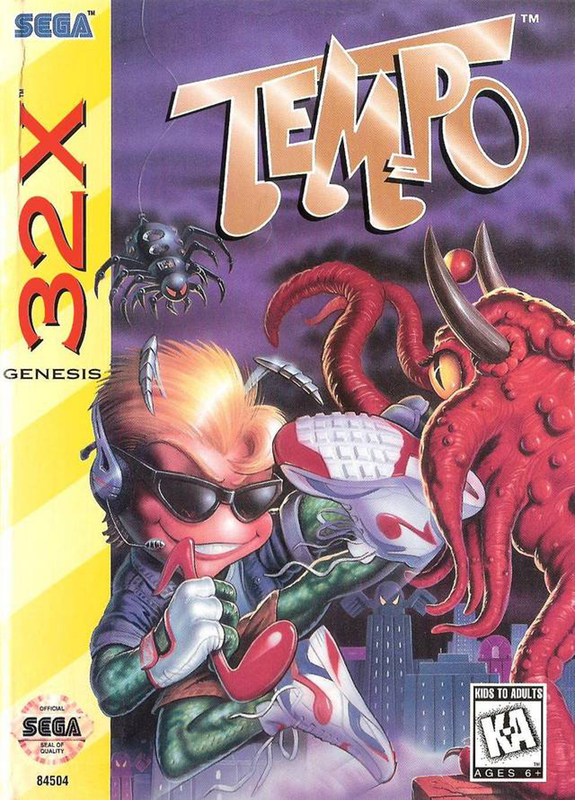 Regarded as one of the better or more desirable games for the Sega 32X, Tempo is a solid 2D platformer with great audio/visual qualities. It was developed by Red Entertainment and published by Sega in 1995 and having completed it myself, I’d put it on top of the list of 32X games. That wasn’t the case when I first started it as I was off put by the animation priority the player character had. But, with time to acclimate to the gameplay I wound up having an enjoyable time. Tempo was visually interesting. I’d often spend a minute admiring the background before moving on. Almost immediately, the stellar audio/visual qualities of Tempo are on display. The game opens with a period, Saturday morning cartoon-style hip-hop song about the eponymous Tempo and it ushered in a wave of nostalgia for that time in my life – childhood. 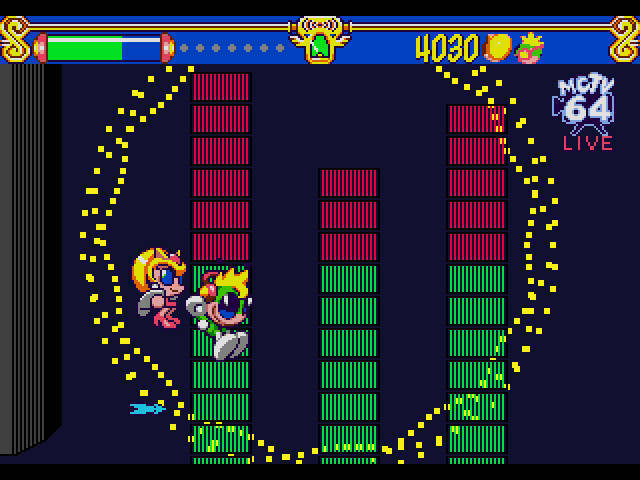 The game has strong musical overtones and accordingly each stage features, at the very least, a rocking accompaniment. 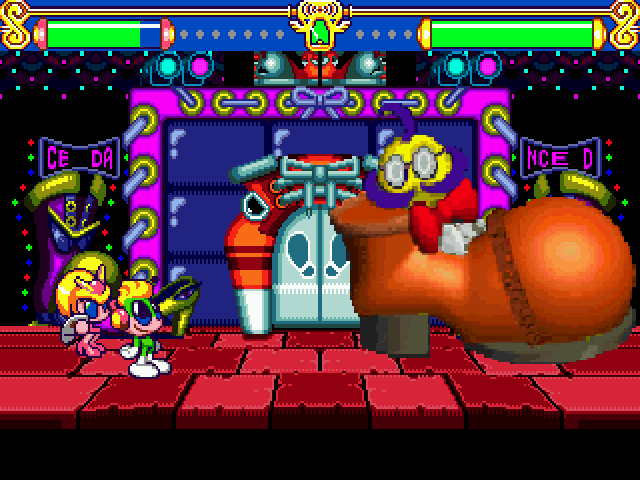 One stage in particular appears to take place in a boom box and features many of the mechanisms one would suspect to see; only now they operate as platforming obstacles. Visually, the stages are a wonder to behold. The level design isn’t particularly noteworthy other than the fact that the stages aren’t simply “scroll to the right” affairs. The paths are generally linear, but they’re winding. For me, this was something fresh and sometimes confusing. To someone who’s played the likes of The Lion King or other period Disney platformers, this might be old hat. Again though, visually, the stages are a wonder to behold. The foregrounds are detailed and well rendered but the backgrounds are something else. Featuring pseudo 3D objects and oscillating sprites, many are right on the edge of being a music visualizer! Tempo had a dance partner in Katy. Her moves were lethal. Like the stage design, the game design isn’t too astounding either. The overall objective of each stage is to navigate the numerous obstacles and enemies that make up the two or three sub-stages, confront a boss, and hopefully, succeed. Tempo’s main offensive maneuver is to jump on his enemies. He can throw musical notes at his foes to stun them, making that attack a little easier. Easier more so if the player stumbles upon one of the myriad power ups which could summon his dance partner or increase the projectile count of his musical notes. If Katy, his dance partner, is tagging along, she’ll attack stunned enemies for him. 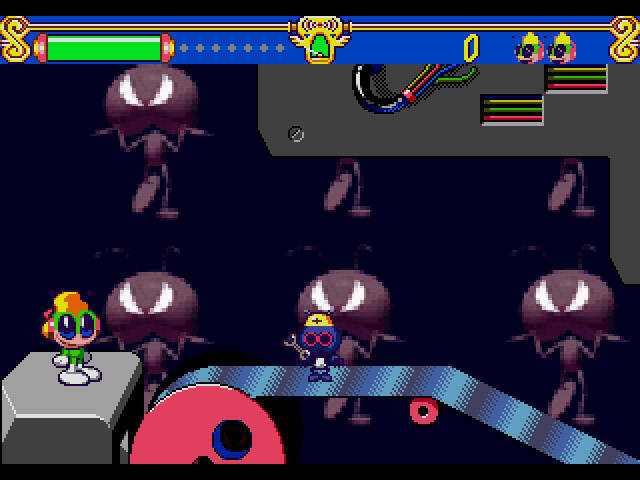 Katy and the musical note power ups come in handy when it’s boss time. Although I was a little perplexed by the level design, it was the first boss that really dampened my opinion of Tempo. I thought it to be very hard with little time to learn my opponent’s formula. After a few attempts, I figured it out though and really began enjoying the game. The stages themselves were often quaint to get through with the bosses almost always providing the brunt of the challenge. This mostly resulted in spending lives to learn their formula, but towards the end, I also had to be very strategic and play defensively as the bosses were more likely to be aggressive. One last comment regarding the gameplay: Tempo himself is given animation priority. What I mean by this (and I’m probably not attributing this concept perfectly to this game) is Tempo animates very, very well but moves very, very methodically; quite slowly in fact. This game is more Warhammer 40,000: Space Marine than Vanquish, if you know what I mean. I generally always prefer a faster, more responsive game but can appreciate what the developers were going for regardless of personal taste. In fact, it’s something I quickly got over and it wasn’t an issue beyond the first stage or two. Some of the bosses appeared rendered in Donkey Kong Country fashion. Tempo saw a turnaround of opinion from me. I was a little down on it after the first stage. The tough boss and animation priority weren’t selling me on the game. However, I was able to clearly tell that this game was a labor of love for the developers and they put a lot of effort into it. There were many redeeming qualities that helped me persevere and continue coming back to it stage after stage. At this point, I definitely put it at the top of the list of Sega 32X games. Not the hardest list to ascend, especially considering I’ve played half-dozen titles, but the word-of-mouth praise I’ve always heard for Tempo holds true; it’s definitely worth seeking out for 32X collectors. I like how the musical note sort of resembles the Nike logo.